South Lake Tahoe resident Gilbert Wetenkamp was in El Dorado County Court Friday, Dec. 4, for a pretrial conference. Wetenkamp is charged with illegally shooting and killing a bear (pictured) back in July. No trial date has been set; he will be back in court in January. SOUTH LAKE TAHOE, Calif. — On Friday, Dec. 4, the El Dorado County Sheriff’s Office addressed their deputies’ use of lethal force during a bear incident that occurred Monday in a neighborhood near Pioneer Trail. Three sheriff’s deputies were called to the scene on Dec. 1 after the department received numerous calls regarding a 700-800 pound male bear that had created concerns in the area for several weeks. The department said that the bear attempted to break into a number of residences and burrow under a deck. Lt. Bryan Golmitz said deputies used non-lethal measures, including beanbag rounds, for an extended period of time in an attempt to frighten the bear away from the area. During their efforts, the bear reportedly turned toward the deputies, causing them to fire on the animal. “For them to use lethal force, they have to have exited their comfort zone,” Golmitz said during a meeting he called with the BEAR League — a Homewood-based wildlife advocacy group. Golmitz described all three deputies as “very experienced” both in law enforcement and handling bears. He also said one of his deputies called him to say that he was “truly upset” over the incident. Fellow BEAR League member Toogee Sielsch agreed. “This shooting was … I don’t want to use the term justified, but understandable,” he said. During the meeting, Golmitz expressed interest in potentially working with the BEAR League in the future to further train deputies in response strategies for future incidents. The sheriff’s office has responded to 177 bear-related incidents so far this year. Monday was the first to involve lethal measures. The man accused of illegally shooting a juvenile black bear in a South Lake Tahoe neighborhood last July was in El Dorado County Court Friday, Dec. 4, for a rescheduled pretrial conference. Gilbert Wetenkamp, of South Lake Tahoe, is alleged to have shot a bear without a permit in or near the garage of his home on July 9. The bear was subsequently found at the base of a tree near Minniconjou Drive and Pioneer Trail, some distance from his home. After meeting with Wetenkamp’s public defender and a representative from the district attorney’s office, Judge Susan Kingsbury scheduled the 75-year-old man to reappear in court Jan. 8, at which time it will be determined if the case will go to trial, and a trial date will be set. Wetencamp and his attorney declined to comment following the proceeding. 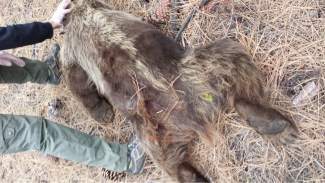 California Department of Fish and Wildlife conducted the initial assessment of the incident before presenting it to the El Dorado County District Attorney’s Office. Wetenkamp was arraigned on Sept. 25, charged with a misdemeanor for illegal taking of wildlife under the state’s fish and wildlife laws. He pleaded not guilty. Self-defense was cited in a previous news story when he was charged in August. If convicted, he faces up to $1,000 fine and one year in jail.